Having finished the main baseboard structure, I thought it might be a good idea to built a loco to test the track before I started laying any. I had already established that a 7mm kit for ‘Dolgoch’ was made by Wrightlines and available on the internet from Keykits, so an order was duly placed. A box of goodies arrived a week or so before I was due to head off to the UK to exhibit Clinkerford at Scaleforum, so I had plenty of time to check out what I was getting and what else I might need to buy while I had the opportunity. I wasn’t happy with the motor and gearbox that came with the complete kit and opted to go for a Mashima 1024 motor and Highlevel Loadhauler gearbox, which were duly purchased at the show. While at Scaleforum, I took the opportunity to do a bit more research into onboard sound, but resisted the temptation to spend any money there and then. After checking the sizes of suitable decoders and speakers, I decided I could probably put the decoder in the chassis and a speaker in the rear water tank. The only downside would be that the decoder would be visible through the large cut-outs in the side frames. I would have to find a way of disguising it in due course. The chassis is a simple fold up affair with slots for the axles that are retained by a keeper plate, again slotted and again folded up. There is no provision for compensation or springing, however, I reckoned I could get some simple springing on the rear axle. Electrical collection is by sprung plunger pickups which I don’t like. I have developed my own design but decided that there wasn’t enough space to incorporate it here. I therefore opted for tied and tested sprung wipers. I wasn’t very happy with the white metal combined crosshead and piston rod and decided to scratch build my own. The con rods would also need beefing up a bit. 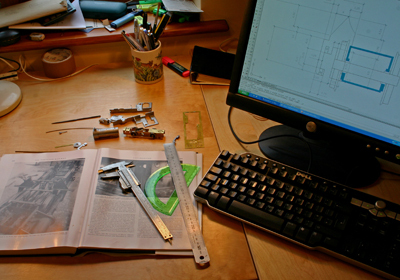 At this point I sat down at the computer with a box of bits, my Talyllyn Railway ‘Bible’, a scale rule and callipers. The model was drawn up in Autocad using the dimensions of the components in the kit. At the same time these dimensions were checked against drawings and photographs. Having got everything drawn up, I was then able to add the changes/new parts necessary for DCC, electrical pick up and suspension, together with details for the fabrication of the new motion parts as well as noting which discrepancies could be corrected and which were better left. Before making up the wheel assemblies, I had to put the gearbox together. At this point I realised that, if I wanted to be able to remove the Mashima flat can motor easily, I would have to mount it flat which meant I would have to increase the width of the slot in the bottom of the boiler but I will cover that later. The motor needs to be removeable as the final gear is secured to the axle with Loctite and it is useful to be able to turn the wheels without applying power. However, until I had the chassis running smoothly I left the final gear loose on the axle. I have never built a chassis without hornblocks so was a bit concerned about accurately ‘filing away the cusp’ in the axle slots. I did it slowly, using a coupling rod to check the distance between the edges of the two slots on each side, until the bearings ran smoothly up and down. While the chassis was still flat I drilled holes for the revised rear mounting screw and suspension mounts (see later). The instructions suggest that folding up the chassis will be assisted if the fold lines are deepened with a triangular needle file. Take great care to make sure you file them absolutely parallel, not the easiest thing to do. Even doing this and using bending bars, I found it very difficult to bend it up square and straight as you have to get it right first time. I ended up with an overall width of 13.2 at the front and 13.4 at the back instead of the 13mm recommended. The good news is that the extra width makes the fitting of the retaining plate easier (it too is a fold up that fits inside the chassis), the bad news is that one axle hole is now 0.2 lower than the other. The axle slots were then checked using axle jigs and the coupling rods before the bottom spacer was soldered in place. I then filed the edges of the spacer flush with the outside of the side frames. When the wheel sets were dropped in, it was apparent that there was plenty of sideplay. I certainly didn’t want any on the front axle as I had the clearance behind the crosshead to worry about and there seemed nothing to be gained by having any on the rear axle on an 0-4-0, so I dug around in my scrap box for some suitable etched washers which duly cured the problem. The retaining plate was then filed and folded up in the same manner. Even with the chassis ‘over width’ this was a tight fit, forcing out the side frames causing the wheels to bind. A quick bit of work with a large file and emery paper soon cured this little hiccup. At this point I substantially reduced the thickness of the bolt head that secures the retaining plate (remembering to deepen the slot with a piercing saw) so that it would be less obvious on the finished model and soldered its nut onto the inside of the bottom spacer. The two halves of the coupling rods were then soldered together, making sure that the overlays were correctly matched. As provided, the rods are nearly twice as wide as on the prototype so these were carefully filed to a more appropriate size. I was generous with the solder at the ends as holes were a loose fit on the crankpin bushes without even the cusp removed. These were now fitted and the chassis again checked for smooth running. As stated previously, I was not over happy with the rest of the motion. 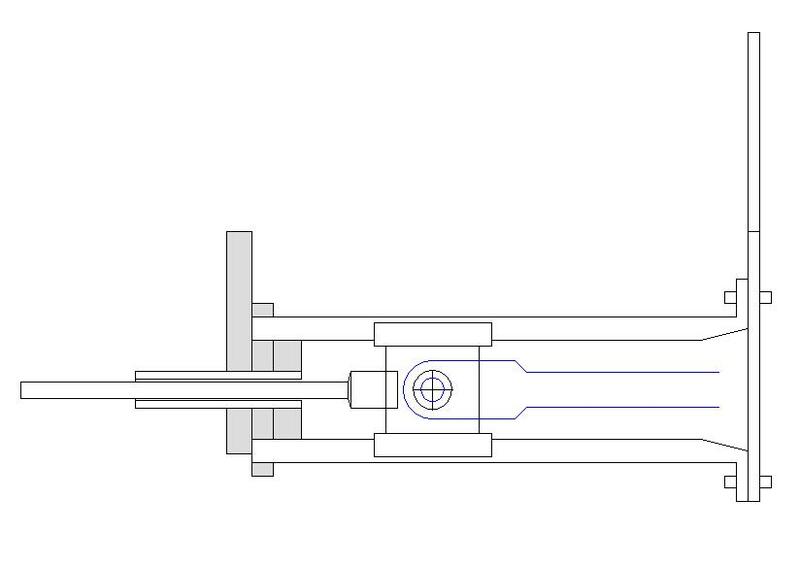 The first job was to reduce the width of the connecting rods to something closer to the prototype (see fig 1). I assume that the bulbous end of the rod was intended to double up as the rear of the white metal crosshead on the kit as designed. The rods were then soldered to some scrap 15thou etch (I never throw anything away when I finish building a kit) to beef them up and filed to their final shape before soldering on the ‘oil box’ (which also need reducing in size to match the rods). As the combined thickness of coupling and connecting rods was now greater than the length of the long crankpin bushes provided, the connecting rod was opened up to allow the retaining nut to be fixed the wrong way round to allow it to be tightened against the bush. In the event, the bush then had to be filed down a bit. This is also a useful trick if you have clearance problems between crankpins and crossheads and it looks more like the real thing! So why didn’t I do it on the front wheels, good point! The cross head (see Fig 2) was made up as follows. A length of 6 x 0.25 brass strip was filed down to 5.5 wide. 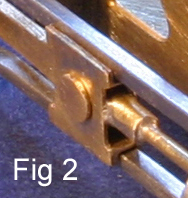 A length of 1.5 x 1.5 x .25 thick brass angle was filed down to 1.3 x 1.0, two 5mm lengths were then cut and the 1.0 leg soldered to the top and bottom of the face of the brass strip. A clearance hole was for a 10BA bolt was then drilled through what would be the centre of the front plate and the strip was sawn off flush with the ends of the angles and filed to the required profile and set aside. The end of the remaining strip was then sawn and filed to leave a 1.0 x 1.0 projection centrally to provide support for the piston rod (see later). The front plate assembly was then carefully lined up and soldered to the strip. Using the bench drill to ensure verticality, the rear plate was drilled though the front plate before being sawn off and filed to shape. A length of 0.8 brass rod was then soldered into the end of 2mm diameter thin wall brass tube. The tube was then sawn off leaving 2mm attached to the piston rod. A flat was filed on one side of the tube and it was then soldered to the rear plate (with its 1mm extension) with the rod central on the slide bars. It helps to use different melt solders on little fabrications like this to stop everything falling apart! A 10BA bolt was then threaded through the assembly and a nut soldered onto the back. A drop of oil on the bolt will stop that getting soldered unintentionally. The surplus bolt was cut off nut and bolt were filed down to about 0.25 thick to give plenty of clearance over the front crank pins. With all that nasty soldering done the bolt was removed, the end of the con rod inserted in the cross head and the bolt replaced. Once happy that everything was moving freely, the merest dab of solder secured the bolt to the rear nut and the head of the bolt was also filed down to about 0.25 thick. This is just enough to grip with a pair of small pliers should you need to undo the assembly at some future date.